Thousands of accounts of abductions can be attributed to the alien/human hybridization agenda. Have humans volunteered to help a race that could no longer have offspring, and if so will we get to meet these hybrid children? resonance which thins the veils of forgetfulness. 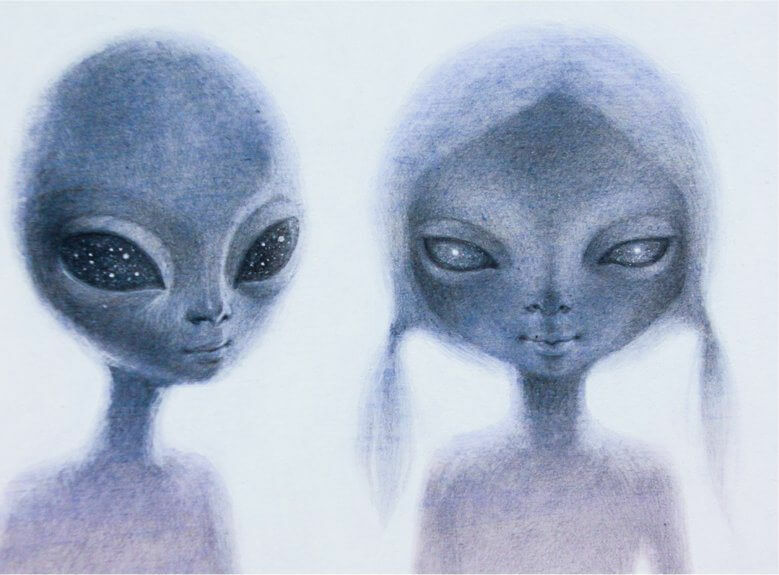 As consciousness rises, the future may involve integrating these hybrid children into the human race on planet Earth. There are several reasons for being taken aboard a spaceship. Family reunions can occur while sleeping that helps a starseed to forget many of their third dimensional worries. Thus the term “sleep it off” takes on a new meaning and upon waking, it seems like a brand new day. Healing can occur in these trips to the spaceship. We have help from our star family in preparing our bodies in order to hold a higher vibration. We also have help from our multidimensional self, which may be in the form of a past or future self connecting with the self of the “now”. Medical study of humans and their DNA seems to be a very common theme. Many races are interested in following the evolution of Earth humans. Included in the medical studies are the use of a human woman’s body to carry a hybrid extraterrestrial child and the use of a human male’s sperm to impregnate an extraterrestrial female. The starseed hybridization agenda includes many races of extraterrestrials who value today’s Earth human DNA. Many races have contributed their DNA to this version of our human makeup, and therefore there are many stewards and watchers of humanity. Humans have been an experiment and have been studied and adjusted since our inception. This current version of our body seems to be close to the “final version” that will allow a DNA activation into our multidimensional selves while existing in physical form. Another reason for the hybridization program involves helping races of extraterrestrials that no longer have the ability to reproduce naturally. Some races that are involved in the program have bred out their sexual organs over generations and realized that their race will die out without some genetic manipulation and interbreeding. Humans just happen to be the most sought after physical form in the Universe at this time and there is an agreement in place with many races and varieties of humans to help these races keep from becoming extinct. Many people have brought forth information about the negative ET races that have agendas for cross hybridization of extraterrestrial and humans related to agendas that are not in the best interests for humanity. Wes Penre discusses some of these agendas in this article. . For the purposes of explanation about hybrid children and possible future contact, I will focus on the agenda of positive ambassadorial extraterrestrial hybridization programs in this article. This would probably include agendas that have been approved by different groups of extraterrestrials through councils and agreements that adhere with Universal Law. of extraterrestrials, clues are being left so that people will begin to question what happened to cause them to lose time or why they are having episodes of déjà vu. on what she has found in over fifty years of her signature QHHT regression therapy regarding abductions and star families. Mary Rodwell is another regressionist that specializes in extraterrestrial contact and hybrid children. Peter Slattery contacted Mary when he realized that he had missed his exit off of the freeway one day, and had driven several miles down the freeway past the intended exit. He had a strong feeling that he was missing time and that something happened. Mary regressed Pete and this is his recording of why they brought him back after his exit, as well as explaining his extraterrestrial DNA heritage. Psychic readings can reveal star family lineage if you are ready to receive the information. Psychics who can “tune in” to your hybrid children can bring messages from them as well as describe to you what they look like. If you have received messages about having hybrid children, then they have deemed you awake and aware enough to know about them and many times, the children yearn for their parent’s acknowledgment. Dreams can leave you wondering whether an experience was real or not. Many times your astral body travels to the ships at night for various reasons. Your physical body may also be taken at night and the memories of what happened can seem like a dream after you are returned and awake. another hybrid donor versus a full fledged extraterrestrial. Waking up with unexplained marks on the body is a sure clue to something out of the ordinary. Some of the Grey’s have been known to put two or three fingers on the body to levitate it up into the spaceship. This sometimes leaves marks with bruises on the body. Other marks could be left from examinations. “There are a lot of children you have given birth to- you will be meeting them in the next 2 to 3 years. At different times on the planet, you had Starseed quality children. They took your eggs and grew them into hybrid children. In the next 2-3 years there will be an event on the planet. The mothers will be ambassadors- you will be documenting it, filming it. You came here to do this. You have ‘vanishing twins’ (did not elaborate). You have planned for many, many incarnations for this lifetime”. Many people are feeling a call to be involved in planning communities in the near future where hybrid children can be reunited with their mothers. These children have the human needs of human contact. Of course, this cannot occur in the current consciousness, but as the split occurs between dense humans and high vibrational humans, the latter will need to migrate toward a different way of living. Cities of light come to mind and I can envision a future where many races of hybrid children can enjoy life on Earth with their human families. Some people will opt to go live with their children on their spaceships and perhaps inhabit other planets later on by starting new communities. Note from the Author: My near future will involve expanding my holistic life coaching to include my recent QHHT skills in hypnotherapy coupled with the method Mary Rodwell uses to help people understand their abduction memories. If this prediction pans out, I am also looking forward to filming the hybrid children reunions and making documentaries which would be around the years 2015 to 2016. In order for disclosure of extraterrestrials and their ties to humanity, fear must be eliminated. One of the first reactions that the ego self (lower self) has when the conscious mind begins to question about abductions is fear. The most recognized hybrid program is with the Greys, who have been given a bad wrap in some circles. It is rare for people to talk about the “good” Greys, but there are over a thousand species of Greys involved in the Earth project, and many of them have humanity’s best interests in mind. Some of these Greys are just workers for other races like Sirians and Orions. These workers may not have a lot of compassion and may seem robotic in their work. However, some of the Greys are intelligent beings that are respected members of the Federation of Planets. Within the different races of Greys there are hybrids as well and these numbers are rapidly growing. A good analogy to describe the Greys would be to take one human being and to say that person represented all of the humans of planet earth. Until you really know which race of extraterrestrial you are dealing with and what their agenda is, you cannot make an informed decision as to whether you should be concerned or not with your involvement. Some of the fear involved from abductions stems from wondering if they volunteered on a soul level to be a part of the hybridization program or if they were taken against their will. Personally, I feel that I am a person of high vibration. Because of the Law Of Vibrational Attainment, I know that by being a high vibrational being, I would only be working with other high vibrational beings. I also have an innate feeling that the beings I am working with are not forcing me to do anything I didn’t agree to. It is best to use your own discernment to decide your future with the hybridization program. because of the implications of the Universal Law of Karma, I would not want to break any agreements out of ignorance from this side of the veil. This would include shunning my ET Hybrid Children and my responsibilities as an Ambassador, at least until I am fully and consciously informed. If there were any indication that I was being hurt or misused, I would revoke any agreements by making a declaration outloud, putting an end to anything that would be causing me harm. Awareness and information are the keys to releasing all fear related to abductions and the realization that you may be a part of a hybridization program. Personally, I left clues on my body that led to the awareness of Orion. I had three moles in a line on the back of my neck that used to bother me when I wore necklaces, so I had them removed. Since I didn’t “get it” back then, I had three moles appear in the exact formation of Orion’s belt on my face, and the day I recognized them was the last day that the Earth was in alignment with the three pyramids in Giza to Orion’s Belt. Just in case that wasn’t enough, I have three small red moles on the top of my thigh in the exact formation of Orion’s Belt. I felt like these clues were to help me realize that there is a connection and to reduce any fear that may arise from stereotypes of the extraterrestrials from Orion. Clues are left for you to begin to question things in order to slowly introduce you to the realization that we all have extraterrestrial ties and that we visit them at night or even during the day. We are moving toward full disclosure through personal experience and remembrance. Those who are questioning and remembering things related to their star family are to be the Ambassadors and mediators between Earth humans and other extraterrestrial races.